Carl is correct that you are registered. I took a look and it showed you registered while not logged in--I moved it to the account you created last year so it shows up in your account dashboard. For anyone else, you should always receive an immediate e-mail confirmation from the East Coast Rally website and PayPal when you register. Check your spam folder, and if you still don't see it let me know. See you all in April! Ok. I think I follow. You waited to register in SD until you "moved", but didn't have to actually take the truck there to register it. 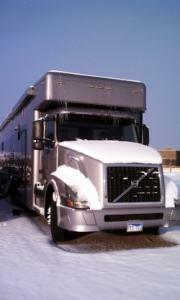 Mark, I'm curious why you had to get the truck to SD--was that for the conversion from truck to motorhome? Just asking because I've always been able to title/register without being physically present with the vehicle. Soliciting electrical expertise at the National HDT Rally. Dave, If Chet doesn't have the supplies (he probably does), stop by and see me for a few Metri-Pack connectors so that you can put plugs on the trim ring in the event you ever need to disconnect it. Sounds like he has the wiring under control, but holler if you need a hand. i dont want to burn my truck up. Traffic report, do I need a raft? I-77 should be in good shape into South Carolina. I-95, I-74, and a ton of state roads in NC have closures. Also be aware that the I-95 detour now in place puts a lot of traffic on secondary state and federal routes--all of northbound I-95 traffic is being routed west on I-74 just inside the NC state line for about 20 miles, then north on US 15-501 and US 1 to Raleigh. From I-74 to US 1, that's just a two-lane road, with a couple of four-way stops, and then you get into Aberdeen and Southern Pines with a couple dozen traffic lights (which gets pretty congested at times without the extra traffic). Dave, You likely had the same problem I do, but with the opposite set of symptoms. But it's rained so much in the last 2 weeks that it's a muddy mess where I'm parked. I thought I had a problem with the air governor, as it wasn't getting to pressure--it was filling the airbags like crazy. When I saw what had happened, the gauge showed 90 psi in the bags. Dumped the suspension and everything pressurized normally. I figure it's either a broken rod at the top end (I can see the bottom), or the valve or arm is loose/broken. If you're just looking for replacement housings, I'd recommend these: http://www.advantagetruckparts.com/volvo-truck-parts/set-of-volvo-vnl-headlights-82329127-82329124/ They're comparable to new Volvo ones, but a lot cheaper. There are others out there, but they're hit-or-miss at best, and sometimes not upgradeable (often with projectors that would leave you scratching your head as to how they manage to reflect any light at all). Many, many vendors, including some Volvo dealers, make use of Volvo part numbers in listings and are ambiguous about the real source of their housings. In other words, there are plenty of fakes being represented as the real deal. Sounds about right, even if that was over length. There are bigger fish to fry. I can't find 75ft either, but could have sworn I'd found it in years past. All I could find was the single-vehicle limit at 45 feet, and the same limits you mention. Since they define a semi trailer as having a kingpin, I can go out and pull a 45' stacker behind a 45' motorhome. Well, at least back and forth across I-90. I'm sure Minnesota wouldn't approve. In most cases, there's basically a set of fines that's available if you want to waive your constitutional rights and plead guilty, sometimes (often?) less than what you would be exposed to if you go to trial. Kansas does have a right to trial by jury for speeding, parking, and equipment violations--it just might not be straightforward how to avail yourself of it. California doesn't have that right, but they do have "trial by declaration", which at least gives you an option to argue without having to go back to appear. Tennessee has a jury trial right for traffic violations, with a few exceptions, but nearly absolute. If there's any possible confinement--even if the prosecution agrees not to pursue confinement--or a maximum possible fine of greater than $50, you have a constitutional right to trial by jury, preliminary hearing to establish probable cause to bind over to a grand jury, etc. Most traffic offenses are class C misdemeanors, including length and width, speeding, following too closely, etc., with $50 and 30 days as maximum penalty. Tennessee goes above a lot of states, in that if you plead not guilty, you have to waive your right to jury trial in writing in order for a trial to commence. In many others, if you fail to make a timely demand, you miss the opportunity. In South Dakota, if the judge tells you in advance that you will not receive jail time, you aren't guaranteed a jury trial as far as I can tell. It depends entirely on where you are. Equipment violations aren't something you have to worry about with interstate agreements like the NRVC or DLA (i.e. where it would go on your driving record), but in South Dakota (as an example) being overlength is a class 2 misdemeanor, which carries a penalty of a fine of $500 and/or 30 days behind bars. That's a good thing for the most part though, over administrative law, as you're afforded constitutional protections, including counsel, trial by jury, and a reasonable doubt standard. Those protections come with little risk, as we all know that a charge against an RVer for being overlength, especially if shorter than commercial vehicles allowed, is all about money. They make money with a fine, and lose money with confinement. Just be careful! A fraction of an inch over puts you into criminal category containing, however unlikely, the possibility of jail time in many states, including SD and TN. 😮 That's not meant to deter anyone, but especially for someone here from another country, a misdemeanor charge/conviction can have lots of other consequences. You might be able to slip by 100,000 times without issue, but that doesn't mean it'll be fun if you do get hassled.